In response to the recent earthquakes that have devastated much of Nepal, Upper School service learning group NKT Connections and the Thailand global travel group (formerly the Nepal global travel group) have teamed up to help. 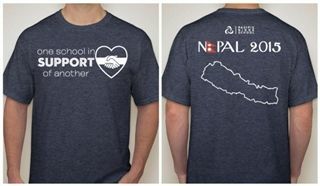 Students are selling shirts, with 100% of the proceeds going toward relief efforts at the Yangrima Boarding School. Following the earthquakes, many of the school's children are now homeless or have been orphaned. If you are interested in helping, please consider purchasing a shirt here. Shirts are on sale through May 22nd and will be available for pick-up during Global Rewind on June 8th.